The legendary Rick Wade hardly needs any introduction. The man behind Harmonie Park Records has been producing soulful, timeless grooves and tapping into the essence of deepness since the early ’90′s. A stalwart of Detroit’s rich music history for the past two decades Rick has long been considered an underground hero – one of those guys we call a “producer’s producer” or a “DJ’s DJ”. 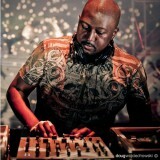 Appearing on over 30 different labels worldwide he pioneered the sound that has become synonymous with Detroit, Deep house. Developing a distinctive style that draws from soul, jazz, funk, disco and adds to it the loopy raw vibe taken from Detroit techno. Known for their universal appeal, the resulting tracks on labels such as Rush Hour, Laid, Moods & Grooves, Track Mode and Yore have become classics in the genre, secret weapons for discerning techno and house DJs alike. The very definition of underground, his music is deep, moody, and emotional with thick bass lines, incredible stings, and solid drum grooves.